Tiger Tales: A Detroit Tigers Blog: How Many Runs Will The Tigers Allow in 2015? The Tigers are counting on recently acquired Alfredo Simon to replace Rick Porcello in 2015. Now that I have projected the Tigers runs scored total for 2015, the next step is to estimate how many runs they will give up. Run prevention is more difficult to predict because pitcher's arms are so fragile and their performance so volatile, but I'll do my best. The Tigers allowed 705 runs in 2014 which was lower than only five other American League teams. That was 81 runs more than the 624 they allowed in 2013 when they had one of the best rotations in recent history. While their starters remained relatively strong last year, they were bogged down by a leaky defense and equally inept bullpen. The return of shortstop Jose Iglesias and additions of outfielders Yoenis Cespedes and Anthony Gose should give them a much improved defense. This might help Justin Verlander, who may have had some bad luck on batted balls (.317 Batting Average on Balls In Play) last year. 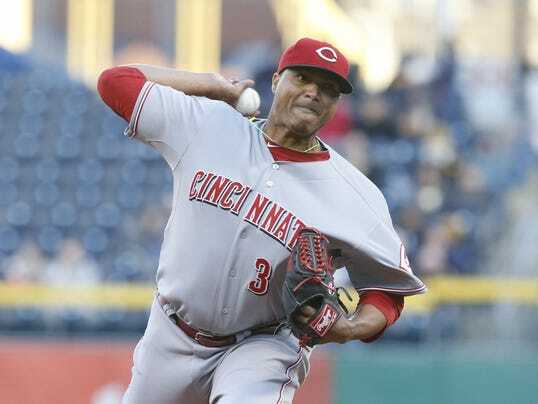 On the other hand, off-season acquisition Alfredo Simon will be leaving the Reds who led the majors in Defensive Runs Saved. For example, Justin Verlander allowed an average of 92 runs per 210 innings (his projected 2015 total) from 2012-2014. He also had 89 Base Runs and 76 FIP Runs. The average of the three numbers above (92, 89, 76) is 86. Since I expect Verlander to be similar to his three-year average next year, I'm estimating 86 runs allowed. I project the rest of the pitchers similarly moving them up or down from their three-year averages if I think they are going to get better or worse this year. In particular, I'm guessing that three starters will be somewhat worse than their averages: (1) Right-hander Anibal Sanchez will regress a little due to his age (31) and injury history. (2) Newcomer Shane Greene likely pitched over his head for the Yankees last year, but I think he'll do better than PECOTA suggests (5.60 ERA!). (3) Simon will not have the benefit of the best defense in the majors this year. My estimates of 770 runs scored and 674 allowed yields a differential of 96 or 9 to 10 wins above .500. Thus, my early call for the season is a 90-72, which would match last year's record. I'll check back again after things get sorted out more in spring training. *Average adjusted for projected innings in 2015. Could an argument be made that a team with an unusually weak bullpen would underperform its Pythagorean projections Re runs scored vs. runs allowed because it will lose an above average number of close games? Might this affect the Tigers? Yes, teams with weak bullpens do tend to under perform their projection. The funny thing is though that the Tigers outperformed last year.